This article is about the chemical element. For other uses, see Radium (disambiguation). In nature, radium is found in uranium and (to a lesser extent) thorium ores in trace amounts as small as a seventh of a gram per ton of uraninite. Radium is not necessary for living organisms, and adverse health effects are likely when it is incorporated into biochemical processes because of its radioactivity and chemical reactivity. Currently, other than its use in nuclear medicine, radium has no commercial applications; formerly, it was used as a radioactive source for radioluminescent devices and also in radioactive quackery for its supposed curative powers. Today, these former applications are no longer in vogue because radium's toxicity has since become known, and less dangerous isotopes are used instead in radioluminescent devices. Uranium is a chemical element with symbol U and atomic number 92. It is a silvery-grey metal in the actinide series of the periodic table. A uranium atom has 92 protons and 92 electrons, of which 6 are valence electrons. Uranium is weakly radioactive because all isotopes of uranium are unstable, with half-lives varying between 159,200 years and 4.5 billion years. The most common isotopes in natural uranium are uranium-238 and uranium-235. Uranium has the highest atomic weight of the primordially occurring elements. Its density is about 70% higher than that of lead, and slightly lower than that of gold or tungsten. It occurs naturally in low concentrations of a few parts per million in soil, rock and water, and is commercially extracted from uranium-bearing minerals such as uraninite. In chemistry, volatility is a material quality that describes how readily a substance vaporizes. At a given temperature and pressure, a substance with high volatility is more likely to exist as a vapor, while a substance with low volatility is more likely to be a liquid or solid. Volatility can also describe the tendency of a vapor to condense into a liquid or solid; less volatile substances will more readily condense from a vapor than highly volatile ones. Differences in volatility can be observed by comparing how fast a group of substances evaporate when exposed to the atmosphere. A highly volatile substance such as rubbing alcohol will quickly evaporate, while a substance with low volatility such as vegetable oil will remain condensed. In general, solids are much less volatile than liquids, but there are some exceptions. Solids that sublime such as dry ice or iodine can vaporize at a similar rate as some liquids under standard conditions. Calcium is a chemical element with symbol Ca and atomic number 20. As an alkaline earth metal, calcium is a reactive metal that forms a dark oxide-nitride layer when exposed to air. Its physical and chemical properties are most similar to its heavier homologues strontium and barium. It is the fifth most abundant element in Earth's crust and the third most abundant metal, after iron and aluminium. The most common calcium compound on Earth is calcium carbonate, found in limestone and the fossilised remnants of early sea life; gypsum, anhydrite, fluorite, and apatite are also sources of calcium. The name derives from Latin calx "lime", which was obtained from heating limestone. 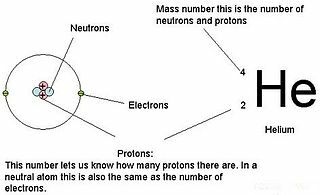 The mass number (symbol A, from the German word Atomgewicht, also called atomic mass number or nucleon number, is the total number of protons and neutrons in an atomic nucleus. It determines the atomic mass of atoms. Because protons and neutrons both are baryons, the mass number A is identical with the baryon number B as of the nucleus as of the whole atom or ion. The mass number is different for each different isotope of a chemical element. This is not the same as the atomic number which denotes the number of protons in a nucleus, and thus uniquely identifies an element. Hence, the difference between the mass number and the atomic number gives the number of neutrons in a given nucleus: . 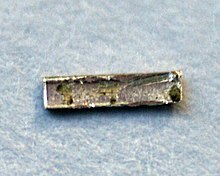 Radium-223 is an isotope of radium with an 11.4-day half-life, in contrast to the more common isotope radium-226, discovered by the Curies, which has a 1601-year half-life. The principal use of radium-223, as a radiopharmaceutical to treat metastatic cancers in bone, takes advantage of its chemical similarity to calcium, and the short range of the alpha radiation it emits. In 2013 it was discovered that the nucleus of Radium-224 is pear-shaped. This was the first discovery of an asymmetric nucleus. The formation of an Austrian monopoly and the strong urge of other countries to have access to radium led to a worldwide search for uranium ores. The United States took over as leading producer in the early 1910s. The Carnotite sands in Colorado provide some of the element, but richer ores are found in the Congo and the area of the Great Bear Lake and the Great Slave Lake of northwestern Canada. Neither of the deposits is mined for radium but the uranium content makes mining profitable. The Curies' process was still used for industrial radium extraction in 1940, but mixed bromides were then used for the fractionation. If the barium content of the uranium ore is not high enough it is easy to add some to carry the radium. These processes were applied to high grade uranium ores but may not work well with low grade ores. ↑ Both values are encountered in sources and there is no agreement among scientists as to the true value of the melting point of radium. The actinide or actinoid series encompasses the 15 metallic chemical elements with atomic numbers from 89 to 103, actinium through lawrencium. Background radiation is a measure of the level of ionizing radiation present in the environment at a particular location which is not due to deliberate introduction of radiation sources. Polonium is a chemical element with symbol Po and atomic number 84. A rare and highly radioactive metal with no stable isotopes, polonium is chemically similar to selenium and tellurium, though its metallic character resembles that of its horizontal neighbors in the periodic table: thallium, lead, and bismuth. Due to the short half-life of all its isotopes, its natural occurrence is limited to tiny traces of the fleeting polonium-210 in uranium ores, as it is the penultimate daughter of natural uranium-238. Though slightly longer-lived isotopes exist, they are much more difficult to produce. Today, polonium is usually produced in milligram quantities by the neutron irradiation of bismuth. Due to its intense radioactivity, which results in the radiolysis of chemical bonds and radioactive self-heating, its chemistry has mostly been investigated on the trace scale only. Radioactive decay is the process by which an unstable atomic nucleus loses energy by emitting radiation, such as an alpha particle, beta particle with neutrino or only a neutrino in the case of electron capture, or a gamma ray or electron in the case of internal conversion. A material containing such unstable nuclei is considered radioactive. Certain highly excited short-lived nuclear states can decay through neutron emission, or more rarely, proton emission. A period 7 element is one of the chemical elements in the seventh row of the periodic table of the chemical elements. The periodic table is laid out in rows to illustrate recurring (periodic) trends in the chemical behaviour of the elements as their atomic number increases: a new row is begun when chemical behaviour begins to repeat, meaning that elements with similar behaviour fall into the same vertical columns. The seventh period contains 32 elements, tied for the most with period 6, beginning with francium and ending with oganesson, the heaviest element currently discovered. 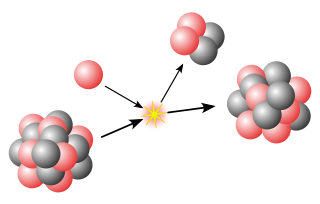 As a rule, period 7 elements fill their 7s shells first, then their 5f, 6d, and 7p shells, in that order; however, there are exceptions, such as plutonium. Radionuclides which emit gamma radiation are valuable in a range of different industrial, scientific and medical technologies. This article lists some common gamma-emitting radionuclides of technological importance, and their properties. Actinides in the environment refer to the sources, environmental behaviour and effects of actinides in Earth's environment. Environmental radioactivity is not limited solely to actinides; non-actinides such as radon and radium are of note. Radium and radon are important contributors to environmental radioactivity. Radon occurs naturally in the environment as a result of decay of radioactive elements in the soil and it can accumulate in houses built on areas where such decay occurs. This radon is among major causes of cancer, estimated to contribute to about 2% of all cancer related deaths in Europe. Radium bromide is the bromide salt of radium, with the formula RaBr2. It is produced during the separation of radium from uranium ore. This inorganic compound was discovered by Pierre and Marie Curie in 1898, which sparked a huge interest in radiochemistry, especially radiotherapy. Since radium oxidizes rapidly in air and in water, the salt form is the preferred chemical form to work with. Even though the salt form is more stable, radium bromide is still a dangerous chemical that can explode under certain conditions. Uranium tailings are a waste byproduct (tailings) of uranium mining. In mining, raw uranium ore is brought to the surface and crushed into a fine sand. The valuable uranium-bearing minerals are then removed via heap leaching with the use of acids or bases, and the remaining radioactive sludge, called "uranium tailings", is stored in huge impoundments. A short ton (907 kg) of ore yield one to five pounds of uranium depending on the uranium content of the mineral. Uranium tailings can retain up to 85% of the ore's original radioactivity. Naturally Occurring Radioactive Materials (NORM) and Technologically Enhanced Naturally Occurring Radioactive Materials (TENORM) consist of materials, usually industrial wastes or by-products enriched with radioactive elements found in the environment, such as uranium, thorium and potassium and any of their decay products, such as radium and radon. Radon-222 is the most stable isotope of radon, with a half-life of approximately 3.8 days. It is transient in the decay chain of primordial uranium-238 and is the immediate decay product of radium-226. Radon-222 was first observed in 1899, and was identified as an isotope of a new element several years later. In 1957, the name radon, formerly the name of only radon-222, became the name of the element. Owing to its gaseous nature and high radioactivity, radon-222 is one of the leading causes of lung cancer. ↑ "Radium". Royal Society of Chemistry. ↑ Lide, D. R. (2004). CRC Handbook of Chemistry and Physics (84th ed.). Boca Raton (FL): CRC Press. ISBN 978-0-8493-0484-2. ↑ Weigel, F.; Trinkl, A. (1968). "Zur Kristallchemie des Radiums". Radiochim. Acta. 10: 78. doi:10.1524/ract.1968.10.12.78. 1 2 Young, David A. (1991). "Radium". Phase Diagrams of the Elements. University of California Press. p. 85. ISBN 978-0-520-91148-2. ↑ "Crystal Structures of the Chemical Elements at 1 bar". uni-bielefeld.de. ↑ Soddy, Frederick (25 August 2004). The Interpretation of Radium. pp. 139–. ISBN 978-0-486-43877-1. ↑ Malley, Marjorie C. (2011). Radioactivity. Oxford University Press. pp. 115–. ISBN 978-0-19-983178-4. ↑ Strutt, R. J. (7 September 2004). The Becquerel Rays and the Properties of Radium. pp. 133–. ISBN 978-0-486-43875-7. ↑ "First observations of short-lived pear-shaped atomic nuclei – CERN". home.cern. ↑ "Radium", Los Alamos National Laboratory. Retrieved 5 August 2009. ↑ Section 14, Geophysics, Astronomy, and Acoustics; Abundance of Elements in the Earth's Crust and in the Sea, in Lide, David R. (ed. ), CRC Handbook of Chemistry and Physics, 85th Edition. CRC Press. Boca Raton, Florida (2005). 1 2 3 Hammond, C. R. "Radium" in Haynes, William M., ed. (2011). CRC Handbook of Chemistry and Physics (92nd ed.). Boca Raton, FL: CRC Press. ISBN 1439855110. ↑ Curie, Pierre; Curie, Marie & Bémont, Gustave (1898). "Sur une nouvelle substance fortement radio-active, contenue dans la pechblende (On a new, strongly radioactive substance contained in pitchblende)". Comptes Rendus. 127: 1215–1217. Retrieved 1 August 2009. ↑ Weeks, Mary Elvira (1933). "The discovery of the elements. XIX. The radioactive elements". Journal of Chemical Education. 10 (2): 79. Bibcode:1933JChEd..10...79W. doi:10.1021/ed010p79. ↑ Ball, David W. (1985). "Elemental etymology: What's in a name?". Journal of Chemical Education. 62 (9): 787–788. Bibcode:1985JChEd..62..787B. doi:10.1021/ed062p787. ↑ Frank Moore Colby; Allen Leon Churchill (1911). New International Yearbook: A Compendium of the World's Progress. Dodd, Mead and Co. pp. 152–. ↑ Curie, Marie & Debierne, André (1910). "Sur le radium métallique" (On metallic radium)". Comptes Rendus (in French). 151: 523–525. Retrieved 1 August 2009. ↑ Ronneau, C.; Bitchaeva, O. (1997). Biotechnology for waste management and site restoration: Technological, educational, business, political aspects. Scientific Affairs Division, North Atlantic Treaty Organization. p. 206. ISBN 978-0-7923-4769-9. ↑ Frame, Paul W. "How the Curie Came to Be" . Retrieved 30 April 2008. 1 2 Terrill Jr, J. G.; Ingraham Sc, 2nd; Moeller, D. W. (1954). "Radium in the healing arts and in industry: Radiation exposure in the United States". Public Health Reports. 69 (3): 255–62. doi:10.2307/4588736. JSTOR 4588736. PMC 2024184 . PMID 13134440. ↑ Frame, Paul. Radioluminescent Paint, Oak Ridge Associated Universities. Retrieved September 17, 2007. ↑ "Environmental history timeline – Radium Girls". 2012-07-20. Retrieved 1 Sep 2018. ↑ Tykva, Richard; Berg, Dieter (2004). Man-made and natural radioactivity in environmental pollution and radiochronology. Springer. p. 78. ISBN 978-1-4020-1860-2. ↑ Lavrukhina, Avgusta Konstantinovna; Pozdnyakov, Aleksandr Aleksandrovich (1966). Аналитическая химия технеция, прометия, астатина и франция[Analytical Chemistry of Technetium, Promethium, Astatine, and Francium] (in Russian). Nauka. p. 118. ↑ Zerriffi, Hisham (January 1996). "Tritium: The environmental, health, budgetary, and strategic effects of the Department of Energy's decision to produce tritium". Institute for Energy and Environmental Research . Retrieved 15 September 2010. 1 2 3 Emsley, John (2003). Nature's building blocks: an A-Z guide to the elements. Oxford University Press. pp. 351–. ISBN 978-0-19-850340-8. ↑ "French Web site featuring products (medicines, mineral water, even underwear) containing radium" . Retrieved 1 August 2009. ↑ Cherbonnier, Alice (1 October 1997). "Nasal Radium Irradiation of Children Has Health Fallout". Baltimore Chronicle. Retrieved 1 August 2009. ↑ Hayter, Charles (2005). "The Politics of Radon Therapy in the 1930s". An Element of Hope: Radium and the Response to Cancer in Canada, 1900–1940. McGill-Queen's Press. ISBN 978-0-7735-2869-7. ↑ Harvie, David I. (1999). "The radium century". Endeavour. 23 (3): 100–5. doi:10.1016/S0160-9327(99)01201-6. PMID 10589294. ↑ Hamilton, Vivien (2016). "The Secrets of Life: Historian Luis Campos resurrects radium's role in early genetics research". Distillations. 2 (2): 44–45. Retrieved 22 March 2018. ↑ "The Four Founding Physicians" . Retrieved 10 April 2013. ↑ Dastur, Adi E.; Tank, P. D. (2011). "Howard Atwood Kelly: much beyond the stitch". The Journal of Obstetrics and Gynecology of India. 60 (5): 392–394. doi:10.1007/s13224-010-0064-6. PMC 3394615 . 1 2 Aronowitz, Jesse N.; Robison, Roger F. (2010). "Howard Kelly establishes gynecologic brachytherapy in the United States". Brachytherapy. 9 (2): 178–184. doi:10.1016/j.brachy.2009.10.001. PMID 20022564. ↑ Rebecca Skloot (2 February 2010). The Immortal Life of Henrietta Lacks. Random House Digital, Inc. ISBN 978-0-307-58938-5 . Retrieved 8 April 2013. 1 2 Ceranski, Beate (2008). "Tauschwirtschaft, Reputationsökonomie, Bürokratie". NTM Zeitschrift für Geschichte der Wissenschaften, Technik und Medizin. 16 (4): 413–443. doi:10.1007/s00048-008-0308-z. ↑ Just, Evan; Swain, Philip W. & Kerr, William A. (1952). "Peacetíme Impact of Atomíc Energy". Financial Analysts Journal. 8 (1): 85–93. doi:10.2469/faj.v8.n1.85. JSTOR 40796935. ↑ Kuebel, A. (1940). "Extraction of radium from Canadian pitchblende". Journal of Chemical Education. 17 (9): 417. Bibcode:1940JChEd..17..417K. doi:10.1021/ed017p417. ↑ Emsley, John (2011). Nature's building blocks: an A-Z guide to the elements. Oxford University Press. p. 437. ISBN 9780199605637. ↑ Viol, C. H. (1919). "Radium Production". Science. 49 (1262): 227–8. Bibcode:1919Sci....49..227V. doi:10.1126/science.49.1262.227. PMID 17809659. ↑ "FDA OKs pinpoint prostate cancer radiation drug Xofigo from Bayer, Algeta". Archived from the original on 15 May 2013. Retrieved 1 October 2014. ↑ Maffioli, L.; Florimonte, L.; Costa, D. C.; Correia Castanheira, J.; Grana, C.; Luster, M.; Bodei, L.; Chinol, M. (2015). "New radiopharmaceutical agents for the treatment of castration-resistant prostate cancer". Q J Nucl Med Mol Imaging. 59 (4): 420–38. PMID 26222274. ↑ Stoll, Wolfgang (2005). "Thorium and Thorium Compounds". Ullmann's Encyclopedia of Industrial Chemistry. Wiley-VCH. p. 717. doi:10.1002/14356007.a27_001. ISBN 978-3-527-31097-5. ↑ l'Annunziata, Michael F. (2007). "Alpha particle induced nuclear reactions". Radioactivity: Introduction and history. Elsevier. pp. 260–261. ISBN 978-0-444-52715-8. ↑ Holden, N. E.; Reciniello, R. N.; Hu, J. P.; Rorer, David C. (2004). "Radiation dosimetry of a graphite moderated radium-beryllium source" (PDF). Health Physics. 86 (5 Suppl): S110–2. Bibcode:2003rdtc.conf..484H. doi:10.1142/9789812705563_0060. PMID 15069300. ↑ Красивая версия "самоубийства" Литвиненко вследствие криворукости (in Russian). stringer.ru (2006-11-26). ↑ Weisgall, Jonathan M. (1994). Operation crossroads: the atomic tests at Bikini Atoll. Naval Institute Press. p. 238. ISBN 978-1-55750-919-2 . Retrieved 20 August 2011. ↑ Fry, Shirley A. (1998). "Supplement: Madame Curie's Discovery of Radium (1898): A Commemoration by Women in Radiation Sciences". Radiation Research. 150 (5): S21–S29. Bibcode:1998RadR..150S..21F. doi:10.2307/3579805. JSTOR 3579805. PMID 9806606. ↑ Redniss, Lauren (2011). Radioactive: Marie & Pierre Curie: A Tale Of Love And Fallout. New York, NY: HarperCollins. p. 70. ISBN 978-0-06-135132-7. Kirby, H. W.; Salutsky, Murrell L. (1964). The Radiochemistry of Radium (PDF). National Academies Press. Albert Stwertka (1998). Guide to the Elements – Revised Edition. Oxford University Press. ISBN 978-0-19-508083-4. Denise Grady (6 October 1998). "A Glow in the Dark, and a Lesson in Scientific Peril". The New York Times. Retrieved 25 December 2007. Nanny Fröman (1 December 1996). 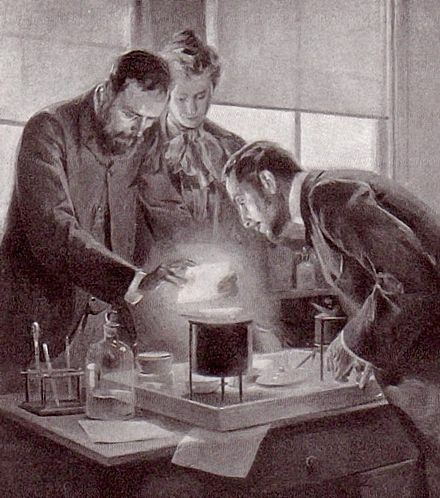 "Marie and Pierre Curie and the Discovery of Polonium and Radium". Nobel Foundation. Retrieved 25 December 2007. Macklis, R. M. (1993). "The great radium scandal". Scientific American. 269 (2): 94–99. Bibcode:1993SciAm.269b..94M. doi:10.1038/scientificamerican0893-94. PMID 8351514. Clark, Claudia (1987). Radium Girls: Women and Industrial Health Reform, 1910–1935. University of North Carolina Press. ISBN 978-0-8078-4640-7. Curie, Marie (1921). The Discovery of Radium . Poughkeepsie: Vassar College. "Lateral Science: The Discovery of Radium". July 8, 2012. Archived from the original on March 9, 2016. Retrieved 13 May 2017.